With the benefit of a century’s hindsight, it’s clear only one man could have reached the South Pole first and made it back alive. In 1911-12, Norwegian explorer Roald Amundsen made his 1,660-mile roundtrip with 52 dogs, four sledges, five men and a single-minded focus on being first. 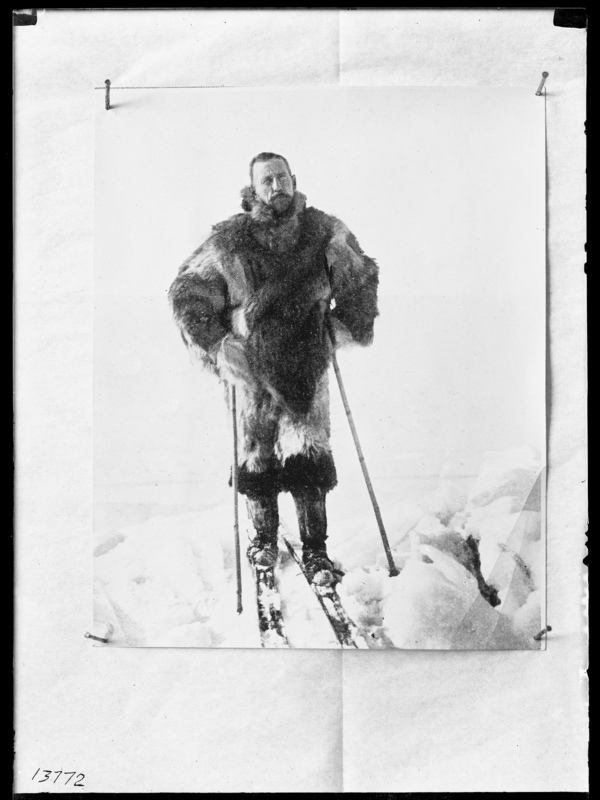 British Navy Captain Robert F. Scott made his final push for the Pole with 10 ponies, 22 dogs, 12 sledges, two motorized sledges, 16 men and a determination to log as much scientific data as possible. The Brits wore cotton; the Norwegians fur. The Brits brought 35,000 cigars and a pianola. The Norwegians did not. Hindsight doesn’t diminish the enormity of what both men set out to accomplish, or the sacrifices they made. Their decisions drive the compelling tale of ‘Race to the End of the Earth,’ the feature exhibition at Victoria’s Royal B.C. Museum. The noise of howling winds greets visitors to the exhibit, which recreates an epic story of triumph and tragedy through original artifacts, photographs, letters and authentic re-creations. 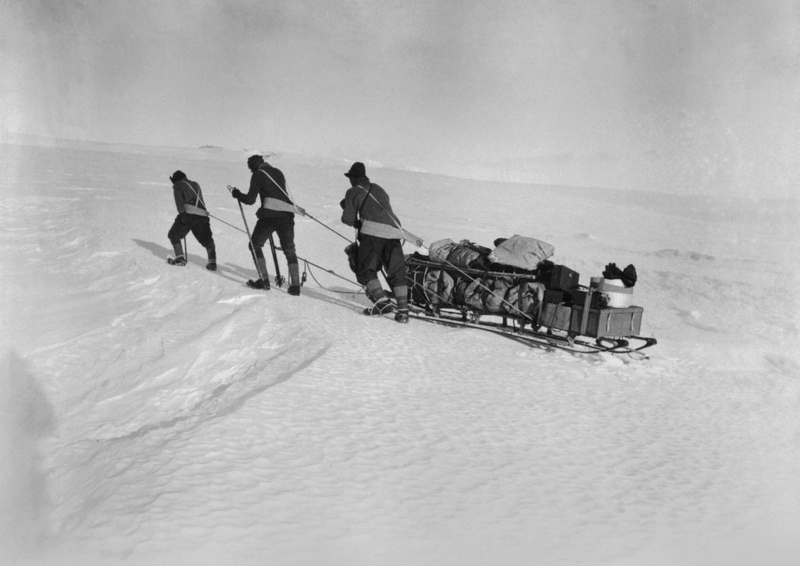 Scott’s Terra Nova Expedition had set out to be the first to reach the South Pole, a feat Scott and four companions thought they had achieved Jan. 17, 1912, only to discover that Amundsen’s team had beaten them by 33 days. Trapped in a nine-day blizzard without food or fuel, Scott and his party died on their return. The Norwegians made it back to their ship and a heroes’ welcome in Hobart, Tasmania, where their triumph was made public in March 7, 1912. The exhibit is divided into seven sections, which chronologically tell the story of the men and their shared goal. Amundsen’s binoculars, chronometer, shotgun and sledge are on display, complemented with letters and photographs. A sledge pennant owned by Cecil H. Meares, Scott’s dog handler, is also among the original artifacts. True to the British tradition of Arctic exploration, sledges featured colourful silk flags to be spotted during blizzards. Meares’ pennant is one of only a few that has survived from the era and is locally significant because Meares moved to Victoria in the late 1920s. Meares isn’t the only connection to Victoria. Scott himself visited the city in 1889/1890 as a Royal Navy Lieutenant. He developed a friendship with a local family and corresponded with them during the next 20 years. And a Canadian member of Scott’s team, decorated scientist Charles S. Wright, worked at the Pacific Naval Laboratory in Esquimalt, and at UBC and Royal Roads before retiring to Salt Spring Island. He died in Victoria in 1975. 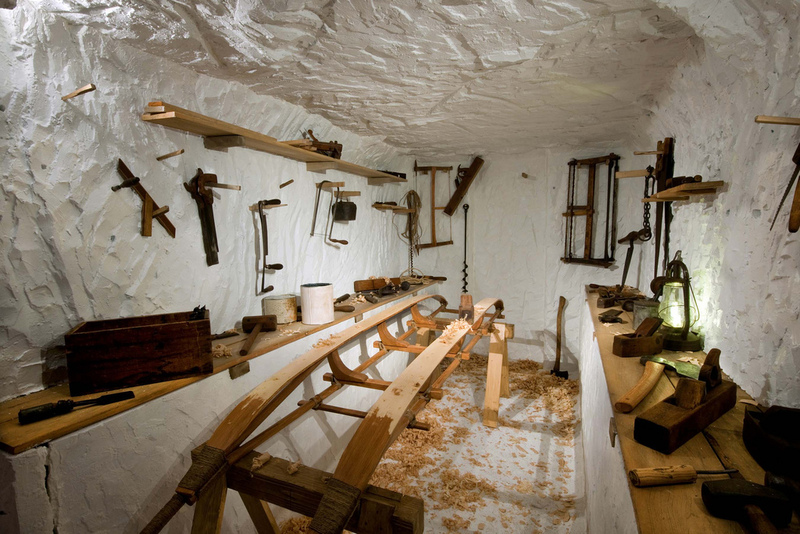 The life-sized reconstructions of Scott’s living quarters and Amundsen’s underground workrooms are impressive. So, too, is an Emperor penguin diorama, vividly recreating ‘the worst journey in the world,’ an apt description of a five-week scientific expedition undertaken in winter by three of Scott’s men to collect Emperor penguins eggs. The three barely made it back alive. But it’s the smaller details that are memorable; the sepia photos of both men in their living quarters, on their skis and hauling sleds (the Brits felt hauling their own sleds showed strength of character); and the farewell letters written by Scott, in which he urges, “for God’s sake, take care of our people”. The British public was inspired to raise more than $75,000 ($7 million today) for those widowed and orphaned by the expedition. In 1913, King George V attended a standing-room-only memorial service for Scott’s team in St. Paul’s Cathedral. The Royal B.C. Museum includes interactive and hands-on educational activities, allowing visitors to see how scientists live and work in Antarctica today. “Touch-this” stations are a nice addition, too, encouraging visitors to feel Reindeer fur and an Emperor penguin’s egg, among other items. RBCM’s conservator Jana Stefan recently returned from her second visit to Antarctica, where she’s been helping to restore Scott’s expedition base camp – still standing after more than a century! Her work preserving more than 10,000 of the camp’s artifacts is presented on video. And for film on a more epic scale, IMAX Victoria in the RBCM is screening Shackleton’s Antarctic Adventure. British explorer Sir Ernest Shackleton’s 1914-1916 Antarctica Expedition is an extraordinary story of survival – beautifully filmed, and narrated by actor Kevin Spacey. The RBCM is the only Canadian stop for Race to the End of the Earth, which runs until Oct. 14. Children’s summer camps and a lecture series featuring B.C. adventurers who have explored Antarctica are scheduled. For details, visit www.royalbcmuseum.bc.ca or call 1-888-447-7977. Victoria’s Parkside Hotel and Spa is a short walk from the Royal B.C. Museum. It offers a family package from $179 a night, including family admission to the museum, two-hour rental of the hotel’s private movie theatre, plus a snack basket with pop, popcorn and candy. Call 1-866-941-4175 or visit http://www.parksidevictoria.com/. B.C. Ferries offers numerous summer package deals to Vancouver Island, including a Victoria Getaway from $109 per person, based on double occupancy. The package comprises one night at the Chateau Victoria Hotel, round-trip ferry from Vancouver for two adults and a car, plus complimentary parking. For more information on this and other deals, visit http://www.bcferriesvacations.com/ or call 1-888-BC FERRY. For all other matters-Victoria, visit http://www.tourismvictoria.com/. Creator of sunshine-coast-trails.com Becky Wayte is probably the Sunshine Coast’s most avid nature bather. You might call Becky Wayte a wanderer. 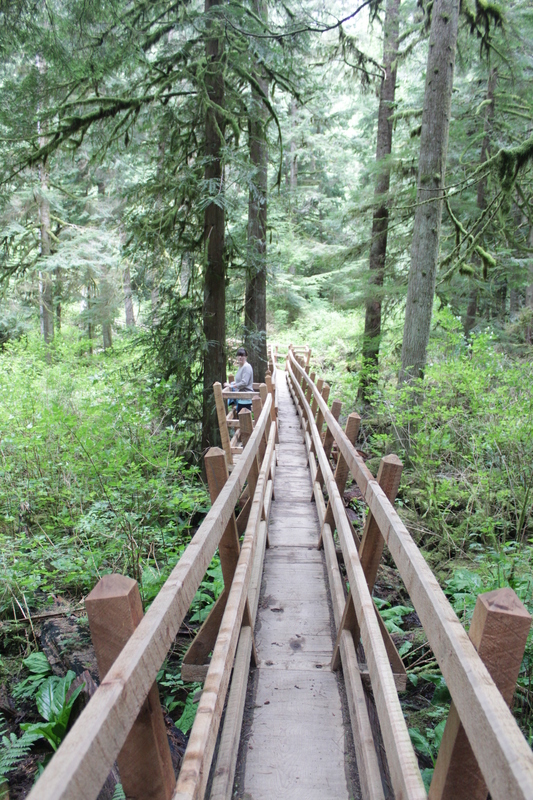 Almost every day for the last 20 years, Becky has hiked or biked a trail somewhere on the Sunshine Coast. It wasn’t until a couple of years ago though, that she became a collector. Some people collect stamps; others baseball cards. 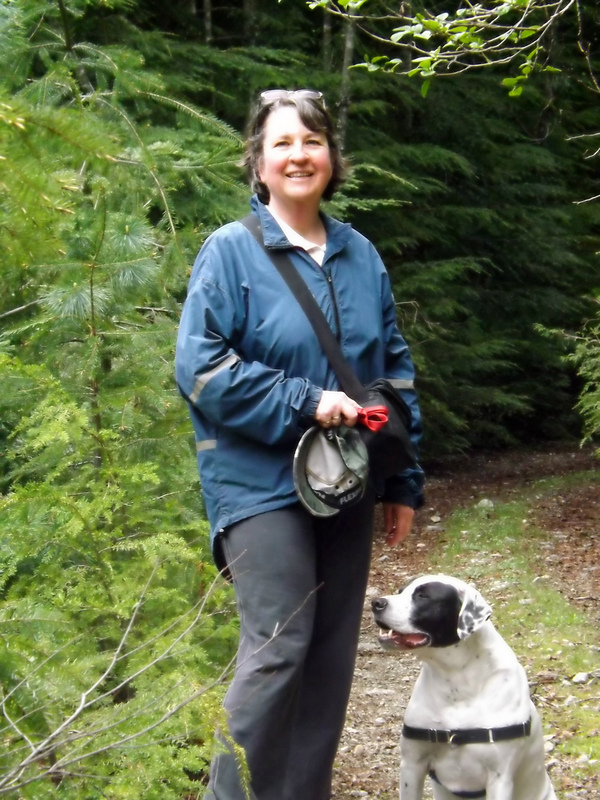 Becky collects trails, maps them with a GPS, and documents them on sunshine-coast-trails.com, a website she created for outdoor enthusiasts. The site lists hundreds of trails, from Langdale to Earl’s Cove, with descriptions, maps, difficulty ratings and useful links. She has her favourites – three of which she describes in her own words in a sidebar to this story. In 2011, hiking three to four hours a day, almost every day, Becky managed to map almost all of the Sunshine Coast’s trails in six months. She’s been updating her collection ever since. The Coast is home to some prolific trail builders, it seems. Cliff Gilker Park, Roberts Creek. She might have added ‘never-ending’! For a moment, we think we may have found a new one. It’s an unusually hot day in May and we’re walking through a dusty trail off Field Road in Wilson Creek. We’re accompanied by Cody, a large, lovable dog from the nearby SPCA where Becky volunteers each week as a dog-walker. The path veers past someone’s back yard and into the forest. “Let’s take a look,” says Becky, in her element. A few minutes later we come to a dead-end. Cody looks at us expectantly and we return the way we came. So what inspired Becky to take on this labour of love? Becky’s well qualified. Not only does she love the outdoors, but she learned to build websites through her work teaching computer courses in the Adult Basic Education Program at Capilano University in Sechelt. With the website established, Ryan Robertson, a Squamish-based app developer, who specializes in creating trail applications for iPhones and Androids, contacted Becky. Becky provided the GPS (Global Positioning System – the satellite navigation application) data and Ryan created the app. Trailmapps: Sunshine Coast costs $10 and is available at the Apple Store and Google Play. For old-school trail lovers, she’s also created waterproof trail maps that are available in Gibsons at Spin Cycles, and in Sechelt at Source for Sports, the Sechelt Visitors’ Centre, and Off The Edge Adventure Sports. Outdoors, technology couldn’t be further from Becky’s mind. While she’s always hiked to combat weight gain, she’s also convinced of nature’s therapeutic benefits. 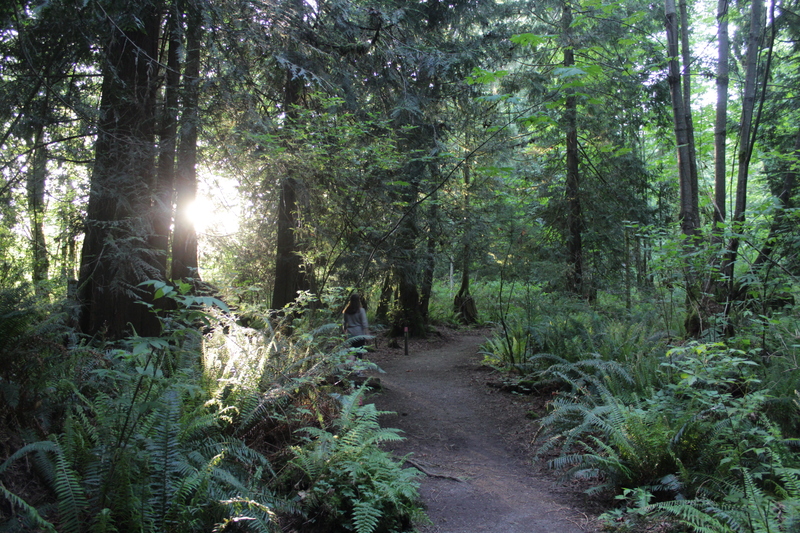 The Japanese have a name for it: shinrin-yoku, or forest bathing. Becky cites Japanese research, which points to the many benefits of simply being in nature – lower blood pressure, higher creative aptitude and boosted immune systems. Becky sheepishly recalls one particular hike that went awry, much to her husband’s despair. “I was hiking up Elphinstone and I’d let people know where I was going and what time I’d return. It took a lot longer than I’d expected though and my phone died. This is a long, fairly difficult climb, but the view at the very top is worth it. The trail to the top can be accessed from the top of Sprockids or via some feeder trails off B & K logging road in Roberts Creek. If you take your time and enjoy a picnic and rest at the top, this hike will likely take you five or six hours. Make lots of noise or wear a bell so the bears hear you coming. Beautiful views of Ruby Lake and a hand carved bench greet you at the highest point along the trail. Easy to make a whole day trip out of this even though the hike itself will probably only take you a couple of hours. You can visit the Iris Griffiths Centre, take a swim in Klein Lake and there is even a feeder trail down to the Ruby Lake restaurant (Trattoria Italiano). This is one of my favourite destinations in the summer months because I always combine a bike ride with a swim. The lake itself is not that well known so often no one else is there, especially on weekdays. There are several trails that connect to create a loop around the lake, with access to the lake from a couple of spots. I park on Middlepoint Forest Service Road and take Copper Head, Dry Feet, a logging road, Old Pole Road and back to Copper Head. There is a short trail off the logging road just north of Dry Feet that takes you into the lake. This is an excellent place to ride your mountain bike if you have pre-teen kids or you just want a fairly flat ride (we don’t have many flat rides on the Coast). Hiking it probably takes about 1.5 hours and by bike about an hour, unless you stop to enjoy a swim. For the definitive web guide to the Sunshine Coast’s trails, visit http://www.sunshine-coast-trails.com.